MIAMI (AP) – The National Hurricane Center says Hurricane Florence has officially come ashore as a Category 1 storm near Wrightsville Beach about 7am. Meteorologists are closely watching where the storm will go, as it slows down. During the early morning hours first responders had to make a number of high water rescues of those who refused to evacuate. Meteorologists say it’s about the water, not the wind, with Hurricane Florence making an extended stay along the North Carolina coast. 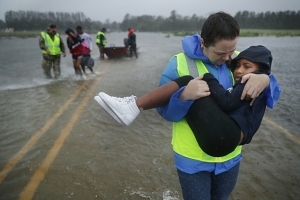 Forecasters say “it cannot be emphasized enough that the most serious hazard associated with slow-moving Florence is extremely heavy rainfall, which will cause disastrous flooding that will be spreading inland.” Top winds were holding at 90 mph — that’s just a Category 1 hurricane — but some communities were already submerged in more than six feet of water. The National Weather Service reported wind gusts Friday morning in Columbia, about 220 miles (354 kilometers) from Wrightsville Beach, North Carolina, where Florence made landfall as a Category 1 hurricane at 7:15 a.m. Friday. 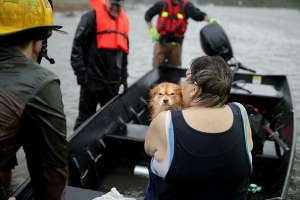 Meantime, across North Carolina residents are trying to prepare for the massive flooding.